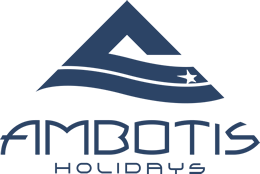 At Ambotis Holidays (EOT 09.33.E.61.00.00427.00) we are committed to protecting and respecting your privacy. Please read this policy as it contains important information about how we use personal data that we collect from you or that you provide to us. When this policy mentions “website,” “platform,” it refers to all pages and functions under www.ambotis.com unless specified otherwise. The data requested in the forms accessible from the site are, in general, mandatory (unless specified otherwise in the required field) to meet the stated purposes. Accordingly, if they are not provided or are not provided correctly, we will be unable to process the request. The site are not directed to individuals under the age of sixteen (16), and we request that they not provide Personal Data through the Services.